Busybee™ Gardening’s head office based in Vancouver, BC with offices in Los Angeles, California and Muskoka, Ontario. We are your organic landscape and garden specialists promoting no pesticides, using only natural methods and beneficial insects in your garden. David Hills, our founder grew up on a farm outside Toronto, Ontario and at a very early age learned the benefits of working the land in order to beautify a property. His passion of landscaping and gardening took him to McMaster University where he completed his degree in Business then on to Mohawk College where he perfected his landscape knowledge. 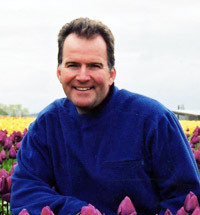 He then relocated to Vancouver to start Busybee Gardening in 1993. He is an Advanced Master Gardener, and has volunteered his services to both VanDusen Botanical Gardens & UBC Botanical Gardens since 1995. David continues to educate himself in various aspects of the business and has recently attended courses through Green Roof Organization. His staff are professional and hard working to ensure our customers a worry free, environment friendly property. We have been in business since 1993. Quality, consistency, and professionalism drive every aspect of our business. We value our relationship with our customers, and believe communication is key in providing exceptional service. We are 100% GREEN with no chemicals or pesticides used on your property. Let your family and pets feel safe in a chemical free garden. At Busybee we strive to improve all aspects of your lawn and garden, with over 20 years of expertise and experience in the organic sector we give your garden a competitive advantage. We are a full time gardening service company that offers a complete range of design and maintenance programs for our clients. Busybee Gardening offers complete landscape design and installation services. © 2015 Busybee™ Gardening. All Rights Reserved.